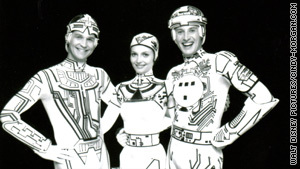 Fan anticipation is high for "Tron: Legacy"
Original co-star says it made technology "magical"
(CNN) -- It was 1981, and Cindy Morgan was filming what she was told would be a half-live-action, half-cartoon for Walt Disney Pictures on a completely black movie set. The director, Steve Lisberger, came up to her and told her that she was going to be flying a "solar sailer" ship, and at another point, she would cross a bridge -- two things that she didn't see in front of her. "I asked him, 'What the hell is going on?' and he showed me these great Syd Mead graphics," Morgan said. Mead, an industrial designer, was in charge of special effects for the movie, called "Tron." It would be the first time that an entire world was created with computer animation. Twenty-eight years later, the movie, which cost a reported $17 million to make, has spawned a sequel, "Tron: Legacy," with a much larger budget. Original "Tron" cast members Jeff Bridges, Cindy Morgan and Bruce Boxleitner behind the scenes. Said Morgan, "The fans kept it alive. It's their movie." What is it about this movie -- considered a box office flop at the time (it made $33 million, according to boxofficemojo.com) -- that made fans at the 2008 San Diego Comic-Con go wild to get a surprise look at "Legacy" test footage? Interest has certainly remained high through the years. "Wherever I would go in the world, no matter what language they spoke, the word 'Tron' would come up," said Bruce Boxleitner, who played the character of Tron and returns in the sequel. "The computer culture was just starting up when we did 'Tron.' There was no internet," said Jeff Bridges, star of both films. "I think [the fans are] guys who were raised on video games, and have a fondness for it." You could certainly say that iReporter David Fike has a fondness for the "Tron" video game. "Anytime I went anywhere with a 'Tron' arcade game, I was begging my parents for quarters," he said. Bridges in the sequel, "Tron: Legacy," which opens in theaters on Friday, December 17. Decades later, Fike owns an arcade console of his own, purchased at an auction. "It had been in a Wal-Mart for most of its life and had some nicks and scratches," he said. "I'm trying to restore the cabinet and get it as close as I can to making it look somewhat new." And, of course, the movie has a special place in his heart. "This was the first movie inside of a video game, so something sparked the imagination and fascinated me. It's probably still my favorite movie of all time despite how badly people reflect on it now," he said. Fike theorizes that, "It was so different, and so ahead of its time that people just didn't get it." Most people even somewhat familiar with the original movie remember the suits worn by characters inside the computer. "The costumes were unbearable, there was no eating lunch in those things," Morgan said. Even so, the original movie's suits are a favorite among fans, no more so than iReporter Jay Maynard, who -- wearing the iconic suit -- gained fame online and on shows like "Jimmy Kimmel Live" and "Tosh.0" as "Tron Guy." "What got me interested at the time the original came out was that I had just begun working as a mainframe systems programmer," Maynard said. "I had always been interested in computers. This was the first time anyone tried showing what went on inside a computer." Maynard isn't alone in being inspired by the movie in that way. At conventions, Morgan said she constantly encounters fans who got into computer programming because of "Tron." Fellow iReporter Joe Machos, a data processor at an insurance company at the time (not unlike one of the computer programs in the movie), saw the movie on opening day, July 9, 1982. "I left that theater, as one might say, rapt," he said. "It had taken me to another place." He noted how, with its use of terms like RAM, "rezzing," and "end of line," it was far ahead of its time. "It accurately predicted a future. We now have this thing called cyberspace. When you say that now, it resonates with people." Machos also is a hard-core fan of all things Disney. During a trip to Disney's Tomorrowland, he left a comment with a woman who worked there asking, "Where's 'Tron?'" According to Machos, she asked him, "Wasn't that a box office failure?" Machos then pointed to an image from "Fantasia" -- which didn't make a profit until more than 25 years after its release -- saying, "That was, too." iReport: A chat with the cast of "Tron: Legacy"
With the imminent release of the sequel, fans have been clamoring for a Blu-ray version of the original, which is quite difficult to find on DVD (Netflix's spokesperson said that the 2002 anniversary release is on "moratorium"). According to Disney, earlier DVD releases are simply out of circulation and a Blu-ray version that Lisberger is personally overseeing will be available early next year. "What I think Disney is doing is smart," said Machos, who thinks it's a good idea to re-establish "Tron" for a new generation. He plans to be at the first midnight screening in costume. 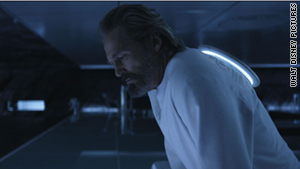 iReport: Jeff Bridges' "zen thing" in "Tron: Legacy"
Aside from the technological, early cyberpunk aspects of "Tron" and other themes (Morgan sees a spiritual component to it; both films have something of a religious subtext), another explanation for its long-standing appeal is that the production design was unlike anything seen before. "The recognizers, those giant staple looking things, I thought those were crazy cool," said iReporter Steve Hungsberg. "I saw the new movie being promoted at Comic-Con and I bought one of each of the recognizer toys there. I also got one for my son. The recognizer was by far the coolest." Fike hopes that "Tron: Legacy" will continue that tradition. "I hope the disc battles are as epic as everyone that's already seen it is saying." Just before catching a sneak preview of the movie, Maynard said, "Everything that I've seen about the new film has impressed me immensely." No matter the reason, there's just something about "Tron." As Morgan put it, "Technology was no longer something dull and dry, technology became magical. That's the secret of 'Tron.'"